In my first article in this series, I showed you a few simple commands that you could use to assess the health of a server’s physical storage. Those commands are great, but they aren’t completely practical for real world use – at least not in the form that I showed you in that first article. Think about it for a moment. You really don’t want to have to manually execute a bunch of PowerShell commands every time that you want to find out whether or not all your disks are healthy. More importantly, the techniques that I showed you were used on a single server. What if you had a lot of servers to monitor? You certainly wouldn’t want to have to manually run PowerShell commands on dozens of individual servers. Even though I am probably getting a little bit ahead of myself, I want to start out by talking about what is going to be required in order to run the script on multiple servers. The first thing that we have to figure out is what servers the script needs to monitor. On the surface this seems pretty simple. The script is designed to monitor the health of physical disks, so it needs to be run against physical servers. Easy enough, right? But there’s a problem. Physical servers aren’t completely static. The servers that exist in your datacenter today might not be the same servers that you will have in your datacenter six months from now. You might choose to retire one or more servers, you might replace some aging servers with new servers, or you could conceivably purchase a few extra servers as a way of scaling certain workloads. If you plan to run a script against your physical hardware, then you will need to come up with an easy way of making sure that the script always targets the correct servers. Fortunately, there are a number of different ways to accomplish this task. This method works pretty well, but again, it isn’t very scalable. 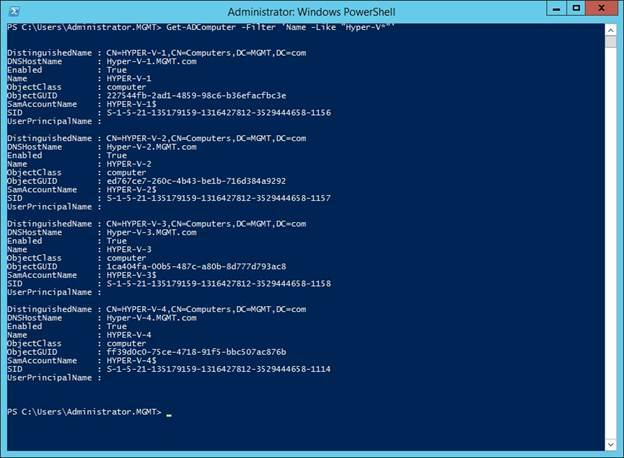 You really don’t want to have to modify your PowerShell script every time that you add or remove a physical server on your network. As you can see in Figure A, this command retrieves a list of my Hyper-V servers. Figure A: I have retrieved a list of my Hyper-V servers. As you can see in Figure B, this command returns the server names and nothing else. Figure B: Here is a list of my servers. The script listed above is really the preferred way of retrieving computer names (at least in my opinion) because it is completely dynamic. As previously mentioned however, it won’t work if you don’t use some sort of ridged naming convention or have some other property that you can use to identify your physical hardware. Furthermore, it requires your physical hardware to be domain joined. So what do you do if this method won’t work for you? Obviously this script is not 100% dynamic, but you won’t have to make changes to the script every time that your physical server inventory changes. All you will have to do is to update the text file. If you have a computerized hardware inventory system then you might even be able to write a database query that gets the server names from your inventory software’s database. So now that I have spent some time showing you how to run a series of PowerShell commands against multiple servers, it is time to begin developing our storage monitoring script. In order to do so, we will need to figure out exactly what we want our script to do and then write code to make it happen. We will define the script objectives in Part 3.